Shipman's Fire Equipment - Amerex Muti-Purpose ABC-rated Dry Chemical Fire Extinguishers are the industry standard for fire protection. Designed to work on most common types of fire. Built using only the highest quality materials and processes to ensure a lifetime of use. 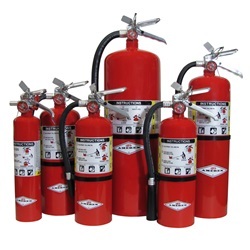 Amerex Muti-Purpose ABC-rated Dry Chemical Fire Extinguishers are the industry standard for fire protection. Designed to work on most common types of fire. Built using only the highest quality materials and processes to ensure a lifetime of use.